The Mage is beefy, but at the same time really clean. The branding is under control and the simple lines topped with a tail pipe of a drip tip looks pretty dope. The thing about that drip tip, it’s pretty wide bore and a bit of a mouth full, but it works and does taper down internally a bit near the chimney. 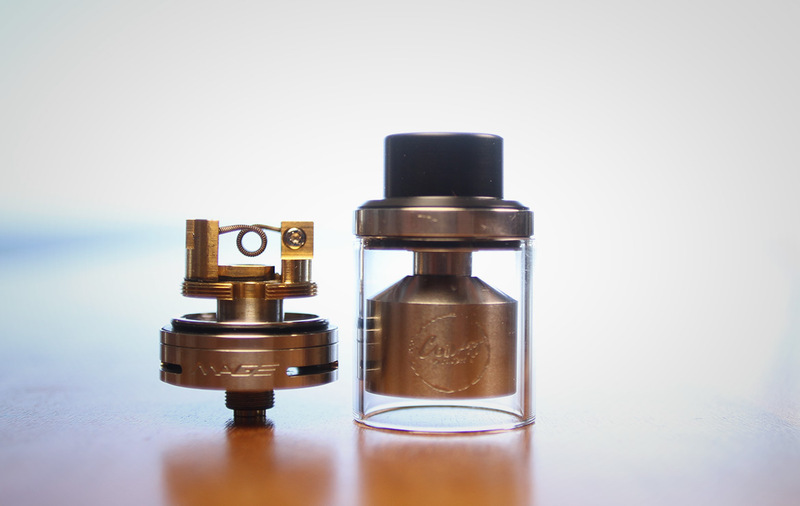 The floating vaper chamber looks plain weird, but really this atty performs like an RDTA. The benefit of the chamber placement is it’s a cinch to wick and performs extremely well. One major down side is there is no access to your build with a full tank, you can open it but expect a mess. The glass tank is a great touch and we just wish it was held in place on the top cap when open (then maybe access to your build with a full tank would be possible). It’s a 24mm tank so expect some trouble with getting a flush fit on some mods, however many mods today are made to accommodate these larger attys. We love it on a HexOhm, it’s a clean, industrial looking vape setup. Flavour is very impressive. Great thick clouds fully of flavour that seems pretty easy to get out of this atty. 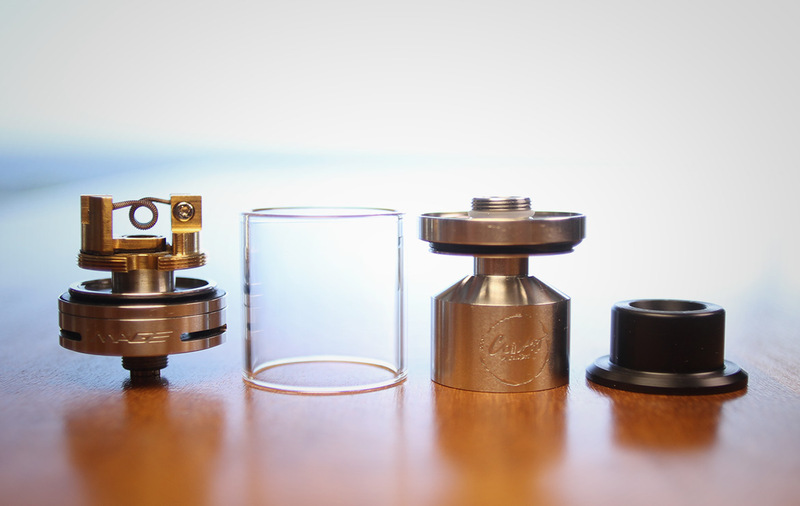 The wicking performs so well that you can expect fully saturated wicks with almost any build. 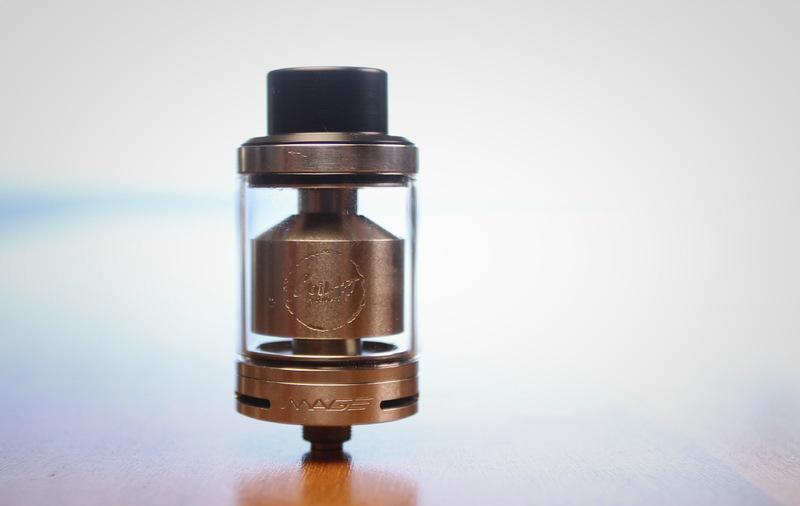 That big drip tip keeps you wondering what the flavour would be like with a smaller bore tip. But it’s still pretty great and the Mage really boarders on a cloud chucker and a flavour atty. Think of the Mage as the perfect atty to pull out when you are craving a cloudier vape day. We have plenty of attys in the review cue and yet we keep vaping the hell out of the mage. Airflow is more on the side of flavourchasing than a crazy full bore chucker. Even fully open there is still enough restriction to keep the flavour going. We like it about half open, it gives us a more intense flavour hit that we crave. It’s a pretty silky airflow, no turbulence or loudness to it, and all with a great o-ring resistance to keep your setting. Building is super easy. We are happy to see the trend picking up on solid single coil decks. 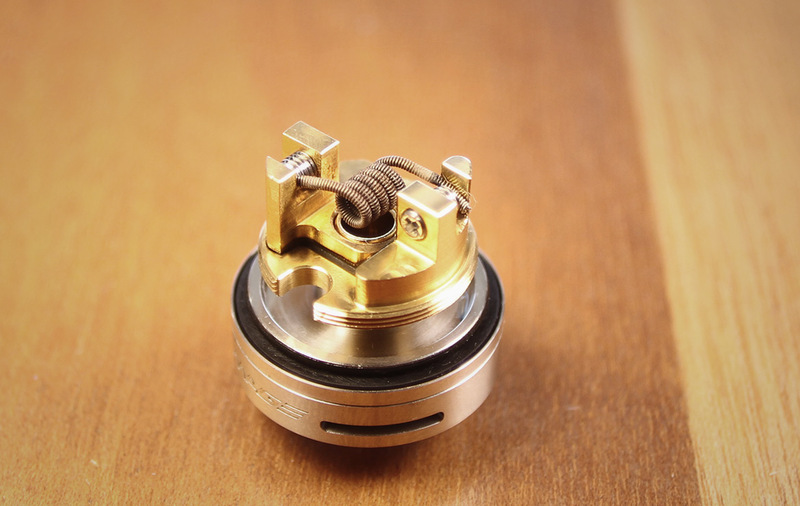 The side clamps capture your coil leads with ease and hold fast. A downer is the philips head grub screws, we don’t understand why these even exist. The good news is the metal is hard and they seem to hold a driver just fine and can handle enough torque to tighten down on pretty thick claptons. The build is claptons all the way. A nice 28×2/36 awg clapton, wrapped 5-6 times on a 2.5mm bit, ohming in at 0.5-0.6Ohms and run at 40W does the trick (4.8V or more, it likes the power). Expect some great flavour and cloud production with the perfect warm temp. 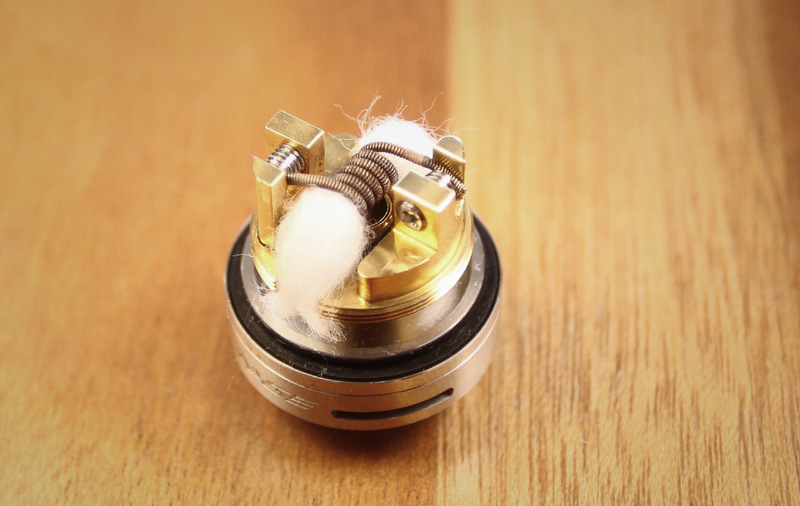 Wicking is a joy, place a decently tight wick and cut the leads so that they trail about half way between the base of the build deck and the bottom of the tank. You should take care in making sure there isn’t too much wick filling the juice ports, we find a simple haircut after they are placed and juiced up so they sit nice and flush does it. Juice capacity is decent at 3.5ml, filling the tank is an easy exercise with that big drip tip also functioning as the top cap. You could fill this tank with any size or style bottle. It’s best to fill some and let the juice make it’s way under the build deck and then finish with a final top up. We are just amazed at how the trapped air releases it’s self every time, no matter the VG ratio. The CoilArt Mage GTA might just be a must have tank. It’s a no brainer, it’s easy to build, performs well and isn’t too large while still looking great. Maybe this GTA thing is going to take off, there is something to the pressure created that contributes to great wicking abilities. At around $20 just grab one, you’ll love it.